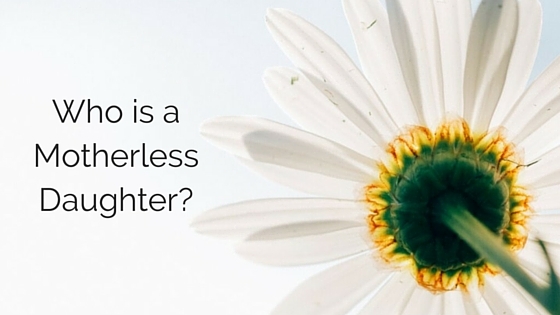 Who is a Motherless Daughter? When I talk about the Motherless Daughters Ministry, people often ask who is a motherless daughter? As I give them the definition of the women who come to this ministry, they are often surprised. I have even had some say, “That’s me!”  We have ministered to women as young as 15 up to 75+. A keen sense of isolation from family. Sharp awareness of our own mortality. Overall feeling of being “stuck” in our emotional development. The tendency to look for nurturing in relationships with partners who can’t possibly meet our needs. The strong desire to give our children the kind of mothering we lost or never had. An intense anxiety about losing other loved ones. A gratitude for the “small moments” in each day. The awareness that loss has shaped, toughened, and even freed us so we can make changes and decisions we might not have made otherwise. Let me give you the definition of a motherless daughter. There are basically 3 groups of women who fit this definition. A motherless daughter can be a woman who has experienced mother loss through death of her mother; this can be early loss, which is 0 – mid 20s. Or it could be later loss after the mid 20’s through the 60’s plus. This definition does not speak to the relationship between the mother and daughter, only if the time of loss was early or late. A motherless daughter might be a woman who has a living mother but has never experienced her mother’s nurturing care. These women often do not realize they are motherless daughters. But believe me, it is very real, more on this in later blogs. They may have a living person called “mother” present in their life, but they did not receive the emotional, psychological and sometimes physical care, nurturing, love, and mothering. A motherless daughter could be a woman who had a mother who may have quit nurturing her at an earlier age and then later loses her through death. The reasons why the mother quit nurturing her could have been because of mental or physical health issues. It may have been drugs or alcohol that kept her from nurturing her daughter. However, the daughter was not emotionally or psychologically equipped to manage this and had to nurture herself. Many times she had to nurture siblings also. Then the daughter grows up and she loses her mother again through death as an adult. This is defined as a double loss. Which one best defines you? Let’s talk about it. I truly beleave the eight commen bonds we have are so true. I started crying as in was reading them . It is always amazing to me to see other women who feel like i do . Because i have always felt like nobody could ever understand the pain in my heart. I was 24 yrs old when my mother passed away . She had just turned 44 .hardest day of my life. It definently was a life changing moment. My mother died when I was 2 weeks old. All of my life I have traveled with a hole in my soul & heart. Never felt anyone around me, family or friends, understood the loss I felt for a Mother I really never knew. I believe it colored most of my relationships and choices over the years. Nice to read this blog ~ touches me that there is someone see the importance of this issue to so many. I used to fit ALL of those bonds and now I fit a few of the categories but not all. That is only because after Mom died when I was 2, my dad became the “heroic” father. He didn’t do everything perfectly, but he still provided security, routine, love and on-going foundation of family after Mom’s death. I owe Dad for all that I am…who I finally came to be after going through some turmoil earlier in my life. Having that stability is SO important and I wish more dads in the world realized that! Early loss for me. And I cried too! I thought … That is me! Every ounce of those 8 commonalities. Yesterday I was at the cemetery to visit my mom, my bf’s grandfather and a friend who passed 11 months ago at 25 due to a rapid course of stomach cancer. His mom and dad happened to also be there. And I couldn’t stop crying over the genuine-ness of his moms hug. I cried for the kindness in the hug. For my loss. For her loss. I realized I will forever be super sensitive to genuine kindness and love. And a longing for the mom I miss so much. And if that makes it seem like something is wrong with me … Well that’s ok. Because I know it’s my moms heart coming out in me. I lost my Mom when I was 11 years old. She was diagnosed with the brain tumor 7 years prior to her death. The trait from the list I can relate to is choosing the partners who were nor nurturing and, some even abusive. With God’s help, I have done some internal restructuring and have learned to assert my needs, care for myself, and talk about my feelings. I am 45 years old and, for the first time for the last 12 months, I have lived without any abuse in my own home. This last year, I found myself grieving more. In search to deal with uncomfortable and painful emotions of grief, I found this page. I identify with all 8 points, but the last 4 really struck a chord with me. I didn’t realize other women who have lost mother’s feel the same way.